One of the things that scared me the most about being injured wasn't the fact that I was unable to run for a few weeks, it was that once I would be able to start running again would I still love it the same way I did before? At first I was angry for not being able to run, but then anger turned into frustration. As the days went on, it got easier to not run. And even though I missed it, I wasn't going as crazy as I was when I first became injured (I know I did not have an injury that required multiple months off, but two weeks is a long time for me to not run). 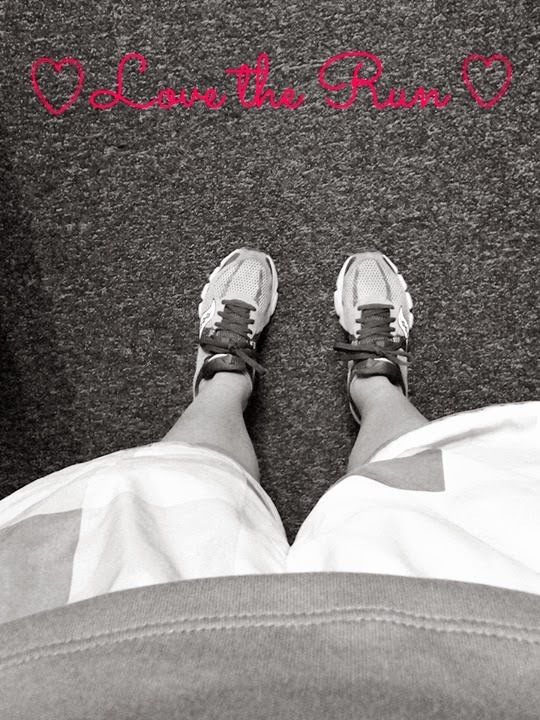 Then I thought, does this mean that I don't love running as much as I used to since it is "easy" to not do it? You are probably thinking that I am crazy, but it's something that I think about. What if I fall out of love with running and triathlon? What am I going to do then? I think about the dreams that I have, to complete an Ironman, to run an Ultra, to maybe someday do an Ultra Triathlon. I won't be able to accomplish any of those things if I lose the love I have for swimming, biking and running. On Sunday and Monday, my foot started to feel better. I had no pain while walking and I knew that I would be able to run sometime this week. I wanted to try on Tuesday but some people convinced me to wait another day or so. We got slammed with another winter storm yesterday so I decided to run on the indoor track at our gym. I was nervous. First, I didn't want to feel any pain. Second, what if I didn't love it anymore? I almost didn't even run yesterday because I didn't want any disappointment, but I knew that it was time. It wasn't the most amazing run I have ever had, I don't even really know which run that would be to be honest, but I didn't feel any pain. I did have some discomfort but that was expected. I only ran 2 miles at about 9 minute average pace, but I was running again! The first mile went by and then as I approached the final two laps around the track (the last .25 miles), I thought to myself, "I need to savor this because this run is going to be over soon". I still love the run, and I hope that I will for a long, long time. Awesome! Glad you're on the comeback trail. This time of year it is easier to not be able to run- as the weather is crappy alot. But, I have a feeling your love of running will continue for awhile... Jamie! Long may you run!! I can dig it. I felt like that for a bit after my injury b/c it's so hard to come back and feel as strong. But once the training kicks in - wham! In love all over again. yay!!! baby steps! good work and glad you're easing back into it...don't want to overdo and end up where you were! I think you will love it for a long time.